This looks set to be an interesting clash in Spain this midweek and Group G stands out from the rest of the EuroCup tables. This is because this is the only game pairing winners and losers from last week, so depending on results pan out, we could be in for an interesting state of affairs at the end of Round 2 in the Top 16. These two sides have met on three occasions in the past and it is Valencia that holds the edge with a 2-1 lead. The Spaniards are currently on a winning streak of 7 games and they have only tasted defeat once this entire campaign. This means that they are full of confidence and they will think that they have a good chance of taking a victory in front of their home fans. It was a close thing in Zagreb last week but Valencia grabbed the win, which is what the best teams manage to do so often. Bojan Dubljevic has been a key player for the Spanish side so far this season, offering an average of 11.2 points per game while Pierre Oriola has chipped in with an average of 9.8 points per game. The Germans lost at home to Malaga last week and with just one win in their five most recent games, it looks like being a tough night on Wednesday for ALBA. One player that has been in form for the Germans side has been Elmedin Kikanovic, who has provided an average of 22.3 points per game, which is the second-best record in the league. Dominique Johnson has chipped in with an average of 15.2 points per game while Dragan Milosavljevic has offered an average of 14.1 points per game. ALBA may be the fifth-best ranked offensive team in the tournament but they have the worst defence, offering an average of 92.6 points per game. 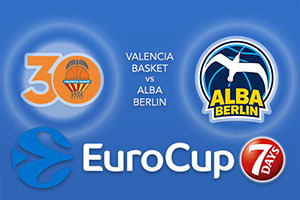 The home side are well ranked to win this game comfortably so take ALBA Berlin at +16.5 at odds of 1.90. You can take the Over/Under market for this game by going OVER 161.5 at odds of 1.90. Bet Now!